Thanks for your interest in Columbia! Whether you want to get in touch with nature, immerse yourself in culture and the arts, or enjoy a delicious meal, Columbia offers endless avenues of adventure. 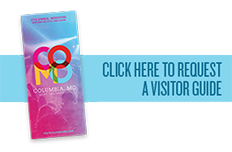 Start your journey below by requesting your copy of the official Columbia, MO Visitor and Area Guide or view the visitor guide online opens in a new window. Note: Visitor Guides are mailed only to addresses outside of the Columbia area. Local residents may obtain a free visitor guide at the CVB offices at 300 South Providence Road. Guides are also available in many area grocery stores, visitors centers, tourist attractions, hotels and restaurants.